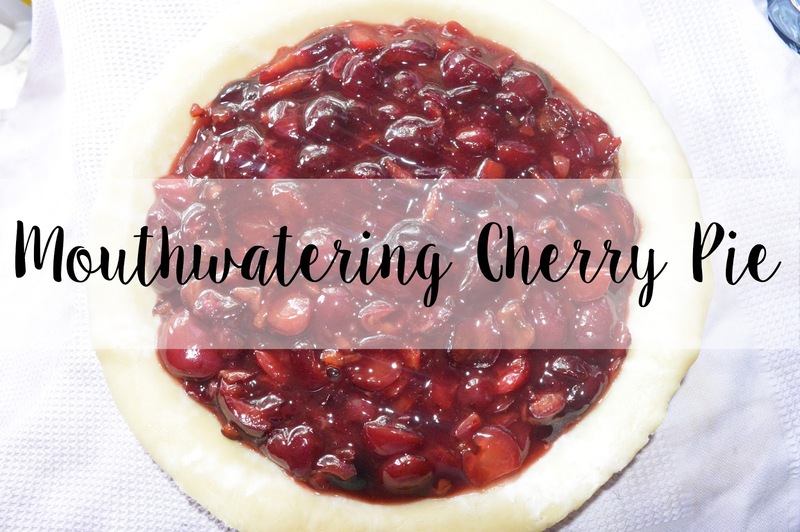 Today I have another baking post for you because this cherry pie looked too good not to share with you. I have three cherry trees altogether and this year we have had some gorgeous looking cherries. Every day I went outside to see if any where ready to pick, and I'd walk back into my kitchen with handfuls of cherries. I did this every day until we had enough cherries to make a homemade cherry pie. It was incredibly mouthwatering and possibly the best cherry pie I have ever eaten and I'd love to see some of you guys make it too! Firstly you need to sift the flour and salt into a bowl, then rub in the butter and shortening until the mixture resembles fine bread crumbs. Add 2 tbsp water, and mix to a firm dough. Adding more water if need be. Knead this dough briefly until it is smooth. Form into a bool, wrap in cling film and chill for 20 minutes. Mix the cherries with the sugar, cornstarch and spices. Divide the pastry into two pieces, one a little large than the other. Roll out the larger piece of pastry and line an 20 x 4cm diameter pie dish. Spoon the filling into the pie. Brush the edges of the pastry with the milk to help it stick together. Roll out the remaining pastry and use this to make a lid, trim the excess pastry off, and crimp the edges with a fork. Score the surface of the pie to let any steam out. Chill for another 20 minutes and then brush the top with milk or a whisked egg. Then sprinkle with sugar. Bake this for 45 minutes or until it is golden. Our pie went slightly dark on the lid but we used brown sugar on top so this was bound to happen. However, my brother loves food which is definitely cooked so there was no issue with this. This cherry pie tasted like Christmas, it was heavenly and I can't wait to make it again. I highly recommend trying out this cherry pie recipe if you love cherries as much as I do. If you do make it, make sure to send me a picture either on twitter or Instagram. My twitter is @kimmcpherson_ and my instagram is @_kimberleyjessica. I can't wait to see how they turn out.